Water impacts economic development, business growth and social well-being in many regions of the world. 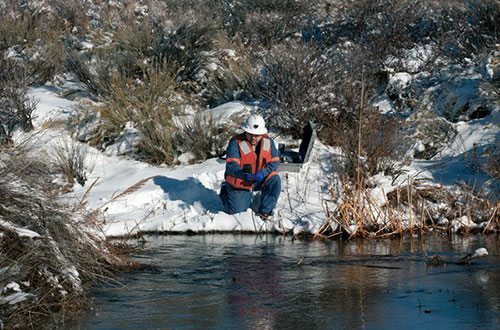 For Newmont, water is a critical resource to its business and the environments in which the company operates. Newmont has developed a Global Water Strategy (GWS) that supports water stewardship and collaborative action. In support of this, the company has also initiated work to align its activities with priority United Nations (UN) Sustainable Development Goals (SDGs) and improve how it measures and reports its impact in a number of areas. As the UN reports, “Without quality, sustainable water resources and sanitation, progress in many other areas across the SDGs, including health, education and poverty reduction, will also be held back.” Due to population growth, increasing food and energy requirements and climate change many watersheds where we operate are under some form of increasing stress. Supporting these changing conditions requires Newmont to be engaged and collaborating on the shared water challenges for us and other water users to assure our future project development and water access. Newmont operations require water for milling and ore processing, as well as, other operational activities. Newmont’s GWS supports the water stewardship within the watersheds in which we operate: focusing on identification and management of risk and opportunities. In doing so, Newmont supports the collaboration to manage and mitigate water impacts from economic growth and the prosperity for the watershed and regions where it operates. Newmont utilizes a Water Accounting Frameworks (WAF) that is aligned with the guidance for water accounting developed by the Mineral Council of Australia (MCA) for the minerals industry. The WAF is used to estimate and report water use and categories of water quality at each operating site. Regularly monitoring, assessing and reporting against these frameworks helps each region continually improve efforts to efficiencies, reduce fresh water use and support the sustainability of the watersheds in which we operate. Nevada Stream Rehabilitation – Newmont rehabilitated a portion of the Maggie Creek Watershed to preserve Lahontan cutthroat habitat. To date, this cooperative effort with Trout Unlimited and others has resulted in 82 miles of stream recovery, around 2,000 acres of riparian habitat improvement and 40,000 acres of upland-habitat enhancement. Water Infrastructure Improvements – Investments in potable community water infrastructure is another example of the company’s contributions to water access and sanitation (SDG6). In Peru, Newmont invested more than $13 million over five years – in partnership with the local municipal water authority – to improve drinking water quality and reliability for the city of Cajamarca. Results of Yanacocha’s investments show that 23,800 people have potable water for the first time thanks to the installation of 5,402 new connections. By understanding and proactively managing water risks Newmont supports projects that provide access to water and sanitation, protect and sustain watersheds for future use, and support sustainable management practices.